It’s great to have some treadmill workouts in your back pocket for those times when it’s too icy, stormy, hot, or just plain dangerous to run outside. The treadmill can also be a great tool for speedwork. I personally prefer to do my speedwork on the treadmill so I don’t have to worry about having to slow down or stop for traffic or other runners. I’m excited to share some of my favorite easy treadmill speed workouts with you today, workouts I’ll be using in my training over the next few months. If you’re a new runner and just starting to add in speedwork, I’d recommend starting out with some easier workouts like a fartlek, or other basic speedwork for beginners. Many of these can still be done on the treadmill, even strides. (For strides, the acceleration of the treadmill up to your top speed mimics how you’d slowly accelerate if you were running strides outside.) But, if you’re at a more intermediate level, these workouts will be perfect for you. Want to become a faster #runner using the treadmill? Try these workouts! Time intervals are probably my favorite way to run intervals on the treadmill. They help keep me from getting too bored, but I don’t have to spend a lot of time concentrating at what exact distance I’ll need to increase or decrease my speed. (“Wait, do I need to slow down for my recovery jog at 2.3 miles or 2.6 miles?” It can start to feel like you need a calculator.) This treadmill workout is perfect if you’re starting to build some speed but you’re crunched for time. You’ll be done with your workout in just 30 minutes! If you’re not sure how fast to run your intervals, take a recent race time and put it into a pace calculator like the Runner’s World Running Pace Calculator or the McMillan Calculator. Or, if you haven’t run any races recently, run a mile as quickly as you can after a good warm up, and use that as your mile time to plug into the calculators. I absolutely love training at race pace on the treadmill because I teach my body exactly what that effort feels like before I take that muscle and body memory out on the road. I ran at race pace on the treadmill a lot when I was training for both my half-marathon and marathon PRs. I hope you love this easy treadmill speed workout that will help you learn your race pace, helping you get ready for race day. When you’re running these repeats, try to focus on your cadence, breathing, and overall how running at that pace feels in your body. 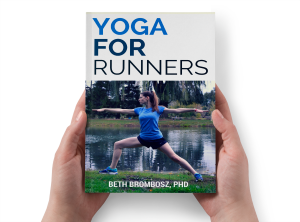 This will allow you to better learn what the pace should feel like on race day. Keep in mind that for the longer races, you’ll go through a taper, and your race pace should feel easier on race day than it does during this simulation if you train correctly. Best of luck to you as you train for your race! Please feel free to ask any questions you might have about these easy treadmill speed workouts in the comments—I’d love to help! What’s your favorite treadmill workout? 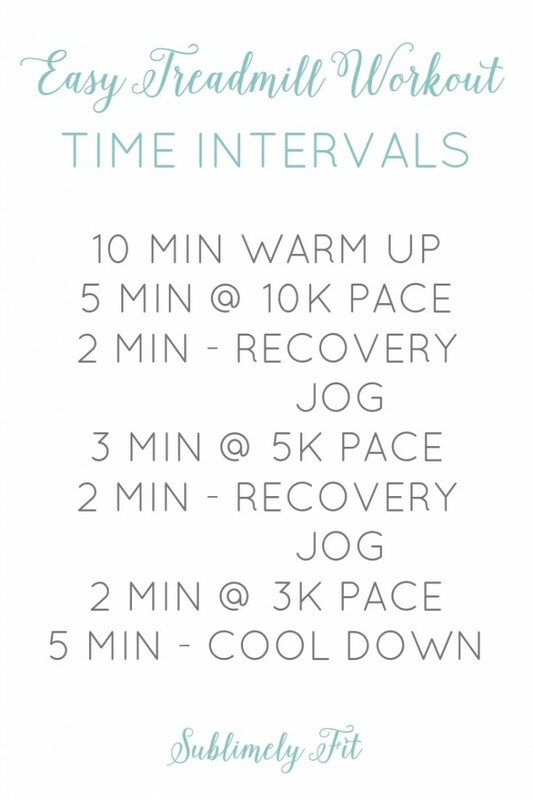 interval workouts are the only ones i can do on a treadmill! Intervals really do break things up, mentally, don’t they? Such a great way to pass the time away! Oh no! Well, you could totally do these not on a treadmill, too. 🙂 Bummer about the treadmill issues–that has to be tough living up in frozen Canada in the winter! 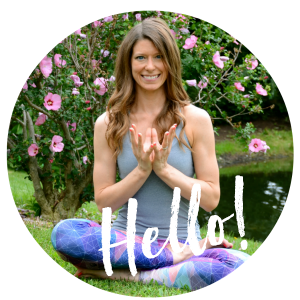 Great workouts–I especially love the learn your pace one! Haha, yeah, I meant more “simple” than “easy”–that’s me being mean with a clickbait-ish title. 😉 I do pretty much all of my speedwork on the treadmill, too. Glad to have good company in my love for speed on the treadmill! I’m a little confused. For the marathon one are you saying do 3 repeats of 5 miles at race pace?ht So the whole workout would be like over 15 miles? That’s a superb way to develop specific endurance for the marathon! I like to have my own athletes slowly develop their ability to run goal pace as the race approaches. They may start with just a few miles at goal pace months out, and gradually over time peak to 3x5mi @ goal pace or for the more advanced athletes a straight 15mi at goal pace, a few weeks out from the event. Yes, love that long race pace run! It’s so helpful–definitely prepared me for my marathon PR! Thanks for your input, Kyle! I’ve done longs on the dreadmill but only out of necessity. I’d consider this training module, but I’m not heading to the belt just to do it. Right now the only workouts I like on the treadmill are short, fast intervals. I’m still not back with long distance running. I love to work up a sweat and be out of breath though! Great workouts! The treadmill is so much easier mentally when there’s a fun and challenging workout to do. 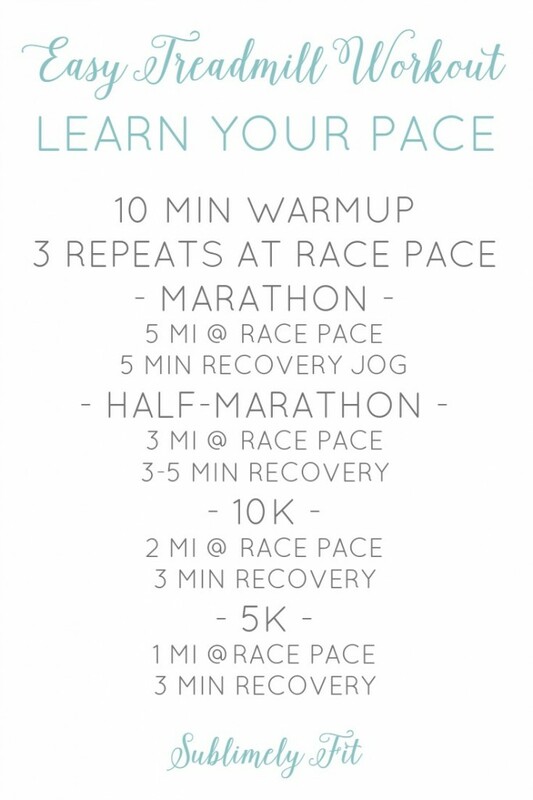 I love the race pace workout – that would be fun on the roads as well! Thanks for the workouts! I can’t do any speed work outside right now because of all the ice, but these sound perfect for the treadmill! I always like to mix up my speed on the treadmill to keep myself from getting too bored. What a nice post it is ! The narration of this article on treadmill with some of main point is very much effective . In this case the post shared here will be conducive more . Thank you author for sharing here such useful and very dependable words on treadmills here . Adding the time intervals is a great idea, not only to prevent boredom but HIIT is a great way to burn more calories in the same amount of time. Loving the workout! Looking forward to try this tonigth 🙂 thanks for the help!